"It means a great deal to the program. Getting to know Rashaan a little bit the last couple years when he was here was good. I just remember his smile. He always had a great smile on his face. He was always really pleasant to talk to. All the guys that played with him and all the people that were around and all the fans that watched him play at that time, I know it'll mean a tremendous amount to them and I know it'll mean a tremendous amount to his family. You never can forget it and you never can put it behind you, but I think this will be a moment – besides of course the funeral – this is a great, great time for their whole family and all of them. When they put his jersey up there, I think that'll be – if I was his parent – a really special moment and a heartwarming-type thing, even though it's a terrible situation that's happened. -- Colorado coach Mike McIntyre on retirement of Rashaan Salaam's No. 19 jersey. Sometime in the first quarter of the Cal-Colorado homecoming game a break in the action will allow time for an on-field ceremony. The late Rashaan Salaam’s No. 19 Colorado jersey will be retired on Saturday at Folsom Field in Boulder. Family members and teammates will gather to celebrate the moment with the Buffaloes’ fans. 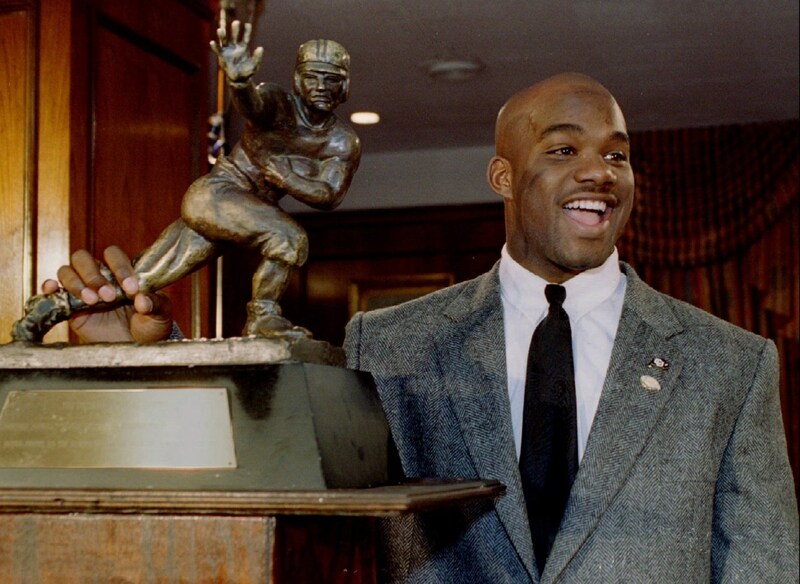 Highlights from Salaam’s 1994 Heisman Trophy season will play on the video board. Choosing which runs from a 2,055-yard season isn't easy. That was Kordell Stewart’s 64-yard Hail Mary touchdown pass to Michael Westbrook to beat Michigan 27-26 as time expired. Salaam liked to talk about how he picked up an outside rush from Trevor Pryce, who went on to play 14 NFL seasons. The block allowed Stewart time to spin away from pressure, set his feet and throw the ball 70-plus yards to the end zone. Anderson tipped the ball to Westbrook for the touchdown that silenced 103,000 fans. Tony Berti remembers Rashaan’s block for a humbling reason. Berti was Colorado’s left tackle that Pryce got around. Berti recalled watching Salaam accept the Heisman Trophy on television at the Downtown Athletic Club in New York. The players had gathered for a team event at a Colorado athletic facility to watch the show. It has been nearly a year since Salaam took his life at age 42. His body was found on Dec. 5, 2016. A gun and a suicide note were found near his body. The Boulder County Coroner’s Office ruled the death was by a self-inflicted gunshot wound to the head at the public park not far from Folsom Field. Whatever darkness Salaam slipped into, resting in peace began in the town where he knew unconditional love. He was always welcomed home as a Heisman Trophy winner. That wasn’t necessarily true in the NFL or his hometown of San Diego. In the NFL, Salaam rushed for1,074 yards and 10 touchdowns his rookie season with the Chicago Bears in 1995. But once he struggled with fumbles and suffered a severe leg injury, he was soon forgotten. When he tried to make a comeback with the San Francisco 49ers in 2003, he hoped packaging honesty with a commitment to conditioning would help him. In an ESPN interview with Solomon Wilcots, he admitted he smoked marijuana and lacked a proper work ethic. But the earnestness backfired on him when the marijuana headlines went viral without context to the story. Salaam also seemingly is forgotten in his hometown. Nearly a a quarter-century later he has yet to be named to the San Diego’s Breitbard Hall of Fame, a body that includes former Heisman Trophy winners Marcus Allen and Ricky Williams. Allen was the first college player to rush for 2,000 yards, Salaam only the fourth. Williams has been enshrined despite his own marijuana history. Salaam returned to Boulder from San Diego at the urging of Anderson and other teammates. Salaam had begun work on a youth foundation at Anderson’s suggestion. Berti shares the regret, but sadly this wasn’t his first time around such pain. He was friends and teammates with Junior Seau, having played for the San Diego Chargers from 1995 to 1998. Seau took his life in 2012. Walton wrote of the darkness he fell into from the pain he suffered living with a collapsed spine. He wrote he wouldn’t take phone calls to avoid help from friends and family before he pulled out of his despair. He also writes about wishing he had seen Seau's pain and fall into darkness. Salaam’s life came to an end in the town he found his greatest fame, but it’s not the final chapter. His number will hang at Folsom Field along with the only three other retired Colorado numbers: Byron Whizzer White (1936-37), No. 8; Joe Romig (1959-61), No. 67; and Bobby Anderson (1967-69), No. 11.